A SET of straight and gleaming teeth makes for a beautiful smile. But how many people who have undergone a little dental maintenance know that they may have inside their mouths some of the first products of a new industrial revolution? Tens of millions of dental crowns, bridges and orthodontic braces have now been produced with the help of additive manufacturing, popularly known as 3D printing. Forget the idea of hobbyists printing off small plastic trinkets at home. Industrial 3D printers, which can cost up to $1m, are changing manufacturing. Things are done differently at an industrial unit in Miskin, near Cardiff, set up by Renishaw, a British engineering company. The plant is equipped with three of the firm’s 3D printers; more will be added soon. Each machine produces a batch of more than 200 dental crowns and bridges from digital scans of patients’ teeth. The machines use a laser to steadily melt successive layers of a cobalt-chrome alloy powder into the required shapes. The process is a bit like watching paint dry—it can take eight to ten hours—but the printers run unattended and make each individual tooth to a design that is unique to every patient. Once complete, the parts are shipped to dental laboratories all over Europe where craftsmen add a layer of porcelain. Some researchers are now working on 3D printing the porcelain, too. The mouth is not the only bodily testing-ground for 3D-printed products. Figures gleaned by Tim Caffrey of Wohlers Associates, an American consultancy that tracks additive manufacturing, show that more than 60m custom-shaped hearing-aid shells and earmoulds have been made with 3D printers since 2000. Hundreds of thousands of people have been fitted with 3D-printed orthopaedic implants, from hip-replacement joints to titanium jawbones, as well as various prosthetics. An untold number have benefited from more accurate surgery carried out using 3D-printed surgical guides; around 100,000 knee replacements are now performed this way every year. That the health-care industry has so swiftly adopted additive manufacturing should be no surprise. People come in all shapes and sizes, so the ability of a 3D printer to offer customised production is a boon. The machines run on computer-aided design (CAD) software, which instructs a printer to build up objects from successive layers of material; a medical scan in effect functions as your CAD file. And software is faster and cheaper to change than tools used in a traditional factory, which is designed to churn out identical products. Compared with the $70 billion machine-tool market, additive manufacturing is still tiny. But it is expanding rapidly, and not just in health care. Overall, Wohlers estimates that 3D-printed products and services grew by 26% last year, to be worth nearly $5.2 billion. That is just the tip of a bigger mountain in the making. McKinsey, a management consultancy, reckons that in terms of things like better products, lower prices and improved health, 3D printing could have an economic impact of up to $550 billion a year by 2025. One reason why 3D printers are becoming more mainstream is that the “inks” they use are getting better thanks to advances in materials science, says Andy Middleton, the European head of Stratasys, an Israeli-American company that makes 3D printers. One method Stratasys uses, called PolyJet, is similar to inkjet printing: cartridges deposit layers of a liquid polymer which are cured with ultraviolet light. The company has just unveiled a new PolyJet model called the J750. It uses multiple cartridges to print items in 360,000 different colours and any combination of six different materials, which can be rigid or flexible, opaque or transparent. The machine is intended to make prototypes as the polymers are not yet robust enough for a final product. Nevertheless, that allows a manufacturer of trainers, for instance, to print a complete shoe in one go, with a rubbery sole and a leather-like upper. The ability to make realistic prototypes greatly speeds up product approval and the time it takes to get to market. Increasingly, however, 3D-printed objects are being produced as finished items, rather than as models or prototypes. 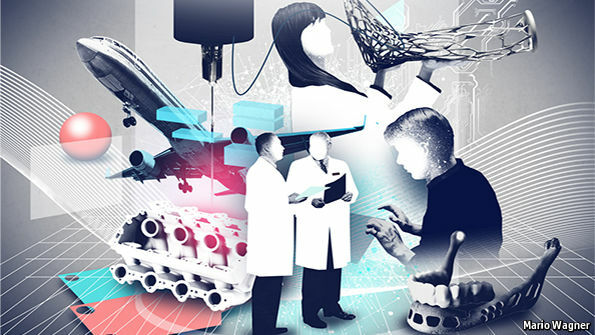 This leads consultants at PWC to conclude in a new report that additive manufacturing “is crossing from a period of hype and experimentation into one of rapid maturation”. Their research found more than two-thirds of American manufacturers are now using 3D printing in some form or the other. Another 3D-printing process used by Stratasys builds parts layer by layer, by heating and extruding thermoplastic filaments. Airbus now uses these machines to print internal cabin fittings for its new A350 XWB airliner. The printers use a resin that meets the safety standards on aircraft. As airlines often specify custom fittings, 3D printing saves on re-tooling. It also allows multiple components to be consolidated into a single part, which reduces assembly costs. It will not be long, some in the industry reckon, before carmakers will offer interior customisation using 3D printers, too. Although further development is needed to speed up additive-manufacturing systems and improve the surface finish, the technology is already trusted enough to be used in products that have to withstand high stresses and strains. GE has spent $50m installing a 3D-printing facility at a plant in Auburn, Alabama, to print up to 40,000 fuel nozzles a year for the new LEAP jet engine it is making in partnership with Snecma, a French company. The nozzles will be printed in one go, instead of being assembled from 20 different parts. They are made from a powered “super alloy” of cobalt, chrome and molybdenum. The finished item will be 25% lighter and five times more durable than a fuel nozzle made with conventional processes. Materials companies are coming up with more and more specialised ingredients for additive manufacturing. Alcoa, a leading producer of aluminium, recently said it would supply Airbus with 3D-printed titanium fuselage parts and the pylons used to attach engines to wings. Alcoa is spending $60m expanding its R&D centre in Pennsylvania to accelerate the development of advanced 3D-printing materials and processes. Large 3D printers are also emerging to make big things. Oak Ridge National Laboratory in Tennessee is working with a company called Local Motors to print cars, or at least much of their structure, using a blend of plastic and carbon fibre. The lab has also teamed up with Skidmore, Owings and Merrill, a firm of architects, to print substantial sections of buildings. The idea is to develop an additive-building process that results in no waste. 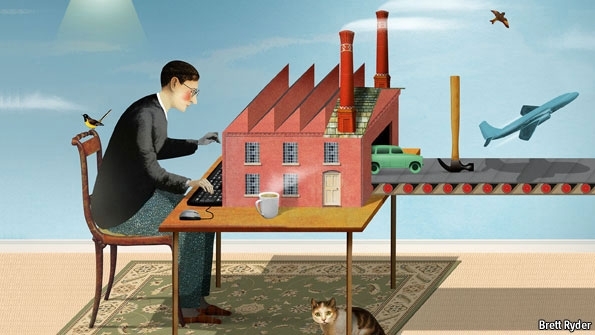 Some factory bosses have said that 3D printing will never replace mass manufacturing. Perhaps, but it does not have to in order to transform production processes. Additive-manufacturing systems are being mashed together with traditional production methods, which themselves are improving with digital technologies. Even old-fashioned metal bashing and welding is going high-tech (see following story). Perhaps the surest evidence comes from China. LITE-ON, a leading contract manufacturer, has just installed a set of 3D printers in a Guangzhou factory that makes millions of smartphones and other portable consumer electronics. The printers, made by Optomec, an Albuquerque-based firm, use a process called Aerosol Jet to focus a mist of microdroplets into a tightly controlled beam, which can print features as small as 10 microns (millionths of a metre). LITE-ON is using the machines to print electronic circuits, such as antennae and sensors, directly into products instead of making those components separately and assembling them into the devices either by robot or by hand. When a manufacturing technology arrives in the workshop of the world, it really is coming of age. This entry was posted in 3D printing, innovation, Manufacturing, Materials, Robitics and tagged 3d printing, additive manufacturing, aerospace, manufacturing. Bookmark the permalink. Paul Markillie is Innovation Editor of The Economist. He specialises in writing about emerging and disruptive technologies. His special report “The Third Industrial Revolution” was published by The Economist in 2012 as a cover story and attracted international interest. Other more recent reports include "Knit me a car", a special report on new materials in manufacturing. His previous special reports have included carmaking, aerospace and logistics. Paul was The Economist’s first Asian Business Correspondent, based in Hong Kong, and also served as Asia Editor.